Beaded lace appliqués accent the bodice, illusion sweetheart neckline, illusion cap-sleeves, and illusion scoop back in this Aldora Crepe wedding dress. A gorgeous illusion cutout train accented in beaded lace appliqués completes the alluring romance of this sheath. Finished with crystal buttons over zipper closure. Bought this gown on July 2018(with certificate). Used only ONCE for an indoor wedding (January 2019). No damages/stains. It is on its perfect condition. 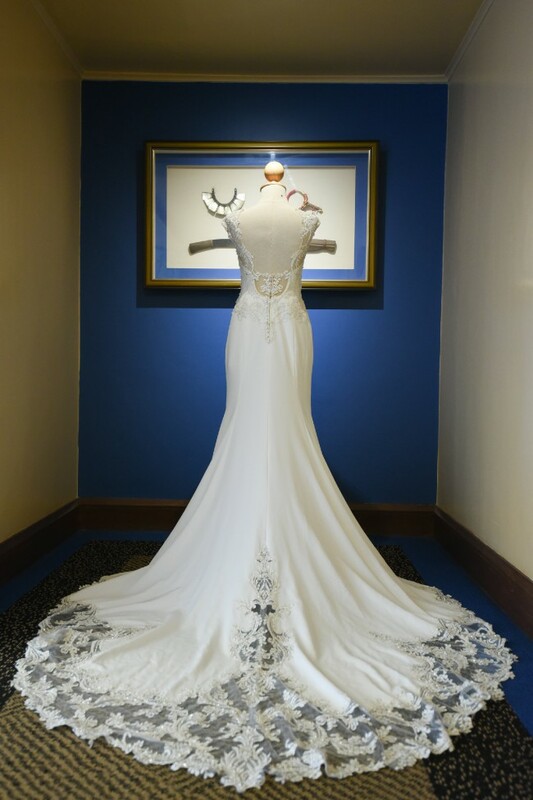 Such a beautiful, simple yet elegant wedding gown. Plus the details and embroidery on the neckline, back and train got me to buy this gorgeous gown. Would choose this gown over and over again. Altered sleeves, hips and and length. Beads and embroidery on neckline and train remains unaltered.